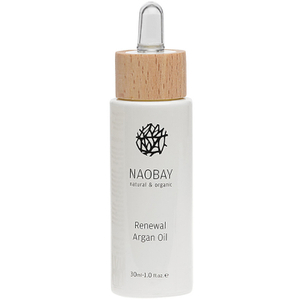 Treat your skin to the multiple benefits of NAOBAY's Renewal Argan Oil. Containing 80% fatty acids (45% of Oleic Acid and 35% of Linoleic Acid), the organic formula can be used to combat signs of ageing, boost skin elasticity, minimise the appearance of fine lines and wrinkles, or applied to acne scars. Rich in Vitamin E, you can expect a deeply nourished, smoothened complexion with dramatically reduced imperfections. 41% of the total ingredients come from organic farming. Apply three drops every evening to a cleansed face, neck and décolletage. You can also apply a few drops of the oil into your regular products and use them during the day.